Whew...it's a toasty one...reaching 98 degrees here today. Whenever it gets this hot out it reminds me of when my husband and I were traveling in Crete and we were staying along the Libyan Sea. It was like 100 degrees, combined with Southern California Santa Ana type winds (if you've ever experienced them before) and you get the idea of how hot and dry it was. We lived off of Greek Salads and good Greek wine and beer...not a bad vacation! I really love the hot weather though, especially if it's only for a few days. There is nothing better than taking a walk at 9:00pm and having it be 80 degrees outside! 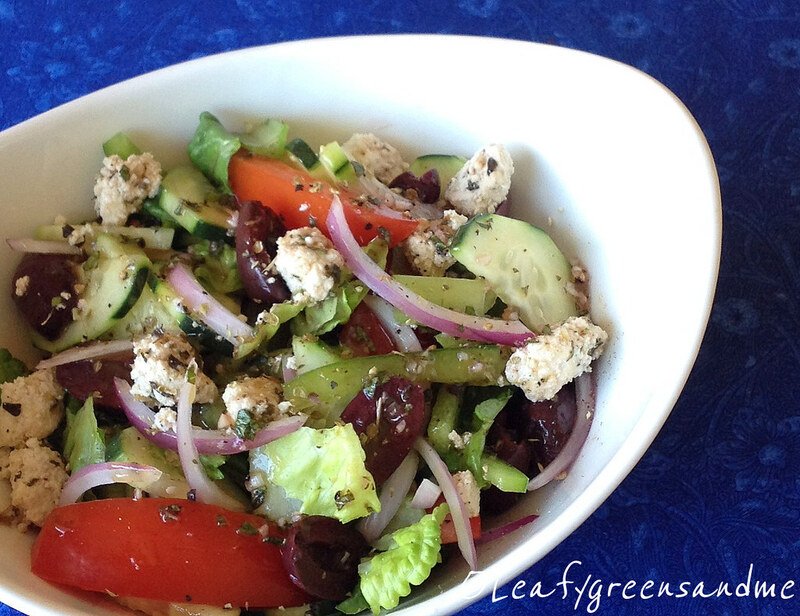 So tonight, the stove and the oven will remain off and a Greek Salad is the order of the day. I've always been interested in making my own vegan cheese, but I just haven't had time. 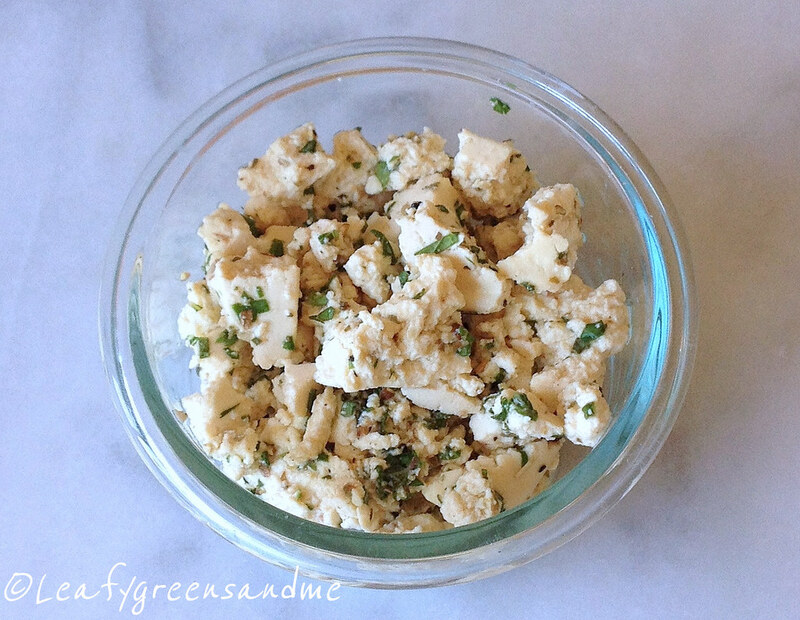 My hubby bought me a vegan cheese making book for Xmas, but they didn't have a recipe for Feta. So I decided to throw something simple together using Greek flavors such as oregano, basil and mint. Since this Feta is made with tofu, it doesn't have a melting quality, but it is great for a salad and really resembles Feta. Plus it gives the salad some protein! Method: Remove tofu from package and pat dry. Slice in half and using a fork crumble into 1" sized pieces. Place in a bowl and add lemon juice, vinegar and salt, stir and set aside while mincing herbs. Combine all ingredients together and let sit for about an hour in the fridge for flavors to combine. Best used within 1-2 days. In Greece they don't crumble the Feta (you get a 1" thick slice on top, drizzled with olive oil and oregano, nor do they use red wine vinegar. They also don't use romaine lettuce, but since this is our dinner this evening I wanted a more substantial salad.